This recipe works best if you have a large stand mixer. If you don't, go ahead and make it anyway. Just beat the dough really well as you add the flour. Each batch of rolls that you make will be better than the one before. Be sure to read the instructions carefully before you begin. There are a lot more tips after the recipe instructions. Warm the milk and water in a small saucepan over low heat. Mix 1/3 of this mixture with the dry yeast in a small bowl and let sit until bubbly, about 15 minutes. In a large bowl, combine remaining milk mixture, melted butter, salt, and sugar and beat until the sugar is dissolved. Add flour, 1 cup at a time, beating on high speed of stand mixer. When the dough gets too stiff to beat, stir in rest of flour by hand, if necessary, to make a soft dough. Turn out onto a floured surface and knead for 5 minutes, until smooth and satiny. Place dough in greased bowl, turning to grease top. Cover and let rise in warm place until light and doubled in size - about 1 hour. Roll out on floured surface to 1/2-inch thickness and cut with 3-inch round cookie cutter. Brush each roll with melted butter and fold in half to make half circles. Pinch edge lightly to hold, so the rolls don't unfold as they rise. Place in two greased 9- x 13-inch pans, cover, and let rise again until double - about 45 minutes. Bake rolls at 350 F for 20 to 25 minutes or until golden brown. Remove from pan immediately and brush with more melted butter. Serve alongside your chicken-fried steak, ham dinner, Sunday dinner, or Thanksgiving dinner and enjoy! Gather some pieces and gently squeeze to form a rough ball. Dip in melted butter and place in a greased pan. Let rise, bake, and brush with more butter when they come out of the oven. You may even like this version even better than the beautiful, perfectly formed half moons. They have crisp edges and are very buttery. 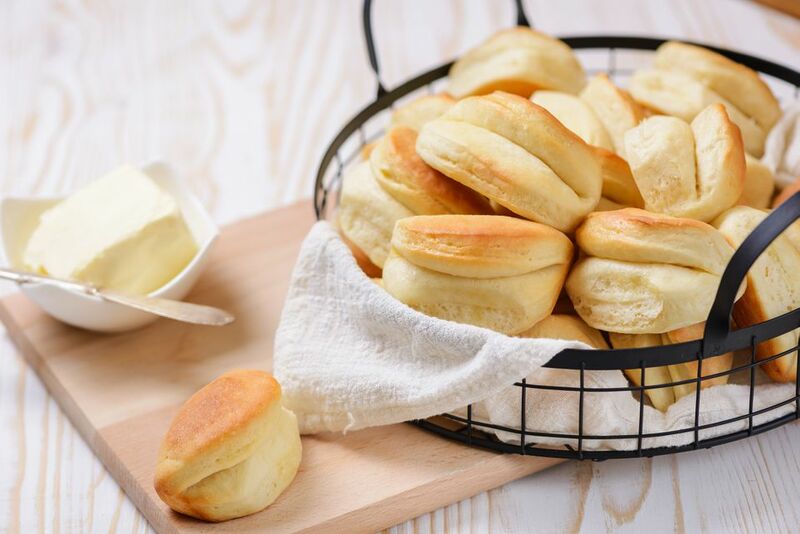 The next day (and the next), heat the rolls in the microwave about 10 seconds per roll on high and they will be as pillowy as they were when they first came out of the oven.